This lovely stamp arrived on my first Postcrossing postcard from Estonia last month. Why do I go so ga-ga over animals with envelopes? 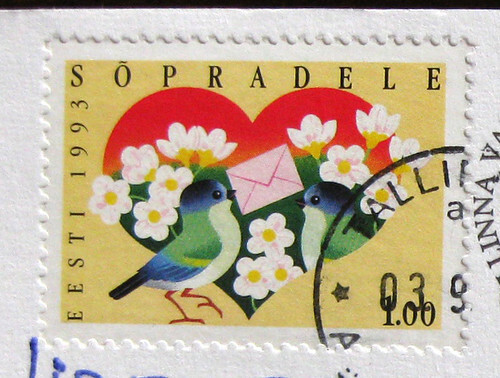 In any case, I am just loving this stamp with the birds passing an envelope from beak to beak. I just go gagga over certain stamps . I got a brooklyn bridge stamp yesterday that I will covet for a while I am sure . this stamp you received is just awesome . Thanks for sharing and posting this .